After a brief lull, the 2006 Atlantic hurricane season was beginning to heat up with the development of Tropical Storm Chris in the Western Atlantic. Chris skirted just north of the Leeward Islands on August 1, 2006. The third tropical depression of the Atlantic season formed in the evening of July 31 just to the east of the Leeward Islands. The tropical depression strengthened into a weak tropical storm the morning of August 1, and was given the name Chris. Chris moved in a northwest to west-northwest direction, keeping its center just to the north the Leeward Islands. 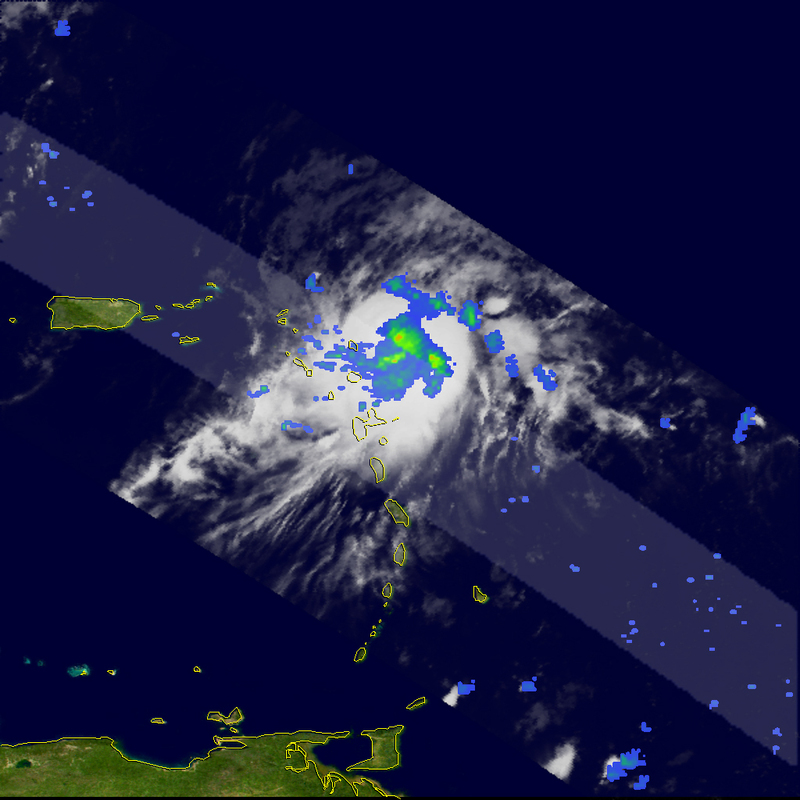 This image was taken at 23:25 UTC (7:25 pm EDT) August 1, 2006, by the Tropical Rainfall Measuring Mission satellite (TRMM), just as Chris was about to pass northeast of Barbuda. 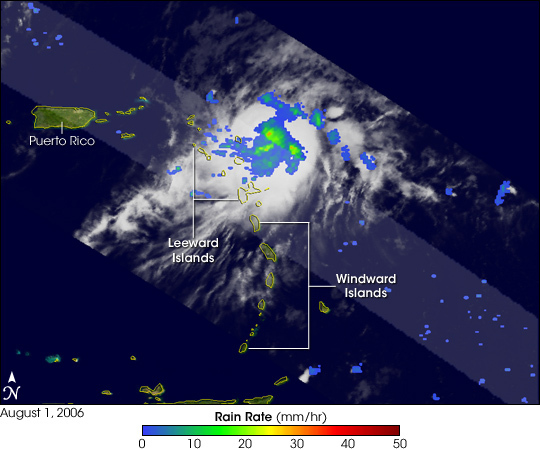 The image shows the horizontal distribution of rain intensity within Chris. Rain rates in the center swath are from the TRMM Precipitation Radar, and rain rates in the outer swath are from the TRMM Microwave Imager. The rain rates are overlaid on infrared data from the TRMM Visible Infrared Scanner. The rain field was fairly compact and shows that Chris was a rather small storm. The center was still poorly defined in this image, with no evidence of an eye. Banding features (curvature) were also weak to non-existent, signs that the storm was still in the process of organizing. There were, however, areas of moderate rain (bright green to orange areas) near the center of Chris. This rain was associated with areas of moderate convection (rising air), which can help to spin-up the circulation it when it occurs near the storm’s core. At the time of this image, Chris was a moderate tropical storm with maximum sustained winds reported at 93 kilometers per hour (58 miles per hour) by the National Hurricane Center. Twelve hours later, Chris’s sustained winds had increased slightly to 100 km/hr (63 mph) as the storm continued track off to the west north-west, just north of the Virgin Islands. TRMM was placed into service in November of 1997. From its low-earth orbit, TRMM has been providing valuable images and information on storm systems around the tropics using a combination of passive microwave and active radar sensors, including the first precipitation radar in space. TRMM is a joint mission between NASA and the Japanese space agency, JAXA.